"Sampath Speaking" - the thoughts of an Insurer from Thiruvallikkeni: garlanding statues ~ EC directives .. .. and covering of statues ! garlanding statues ~ EC directives .. .. and covering of statues ! Lok Sabha Election is the most trending news ! - India goes to polls in seven phases from 11 April to 19 May 2019 to constitute the 17th Lok Sabha. The counting of votes will be conducted on 23 May, and on the same day the results will be declared. 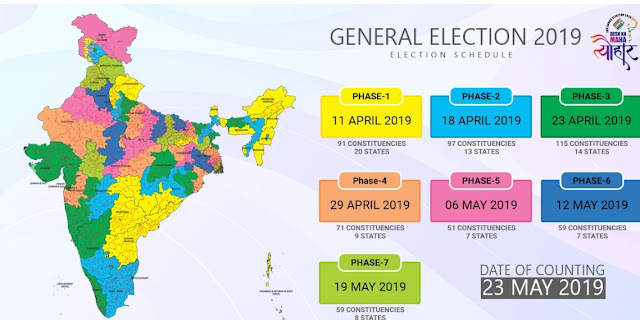 Legislative Assembly elections in the states of Andhra Pradesh, Arunachal Pradesh, Odisha and Sikkim will be held simultaneously with the general election. Since the independence, political parties in India have grown many folds, up by about 780 percent from a handful of 54 parties in 1950 to 475 parties in 2014.To be recognised as a state or national party, registered political parties have to secure a minimum percentage of valid votes/numbers of seats in the Lok Sabha or state assembly. Election Commission is the body that conducts elections; they have prescribed model code of conduct for guidance of political parties and candidates. 2. Criticism of other political parties, when made, shall be confined to their policies and programme, past record and work. Parties and Candidates shall refrain from criticism of all aspects of private life, not connected with the public activities of the leaders or workers of other parties. Criticism of other parties or their workers based on unverified allegations or distortion shall be avoided. 5. The right of every individual for peaceful and undisturbed home-life shall be respected, however much the political parties or candidates may resent his political opinions or activities. Organizing demonstrations or picketing before the houses of individuals by way of protesting against their opinions or activities shall not be resorted to under any circumstances. 6. No political party or candidate shall permit its or his followers to make use of any individual’s land, building, compound wall etc., without his permission for erecting flag-staffs, suspending banners, pasting notices, writing slogans etc. 7. Political parties and candidates shall ensure that their supporters do not create obstructions in or break up meetings and processions organized by other parties. Workers or sympathisers of one political party shall not create disturbances at public meetings organized by another political party by putting questions orally or in writing or by distributing leaflets of their own party. Processions shall not be taken out by one party along places at which meetings are held by another party. Posters issued by one party shall not be removed by workers of another party. .. .. .. .. Election commission has jumped into action ~ at many places, the names of political leaders inscribed on public platforms, statues etc., have been covered – at Marina saw that newspapers have been pasted at the pedestal of many statues crudely covering the name of the then Chief Ministers who had inaugurated at that time .. .. Marina beach has many statues dotted along – the recent addition being that of ‘Tholkappiyar’ in front of Oriental research Institute of Madras University nearer my home. ……. the culture of statues has a long history and is not new to Tamilnadu alone – and there have been some clashes arising out of issues involving statues, it is another colonial vestige. At important road junctions, at landmark buildings – we have statues of leaders and others lying uncared for in a state of neglect. There are statues in a row in the Marina beach with bird droppings and dirty looks. In the northern State, one CM went berserk installing statues of party symbol and self and the opposition leader appealed to the Centre not to release funds to State fearing that they would create more statues. Originally, statues were installed to propagate the memory of great leaders, poets and visionaries of the Society and even in a place where rationalists question religion, there arose very many statues to leaders of importance. It was to instill in upcoming generations some knowledge and recalling of the glorious acts of the erstwhile leaders. It is unfortunate that instead of learning, sometimes they become the reason for public disturbance. 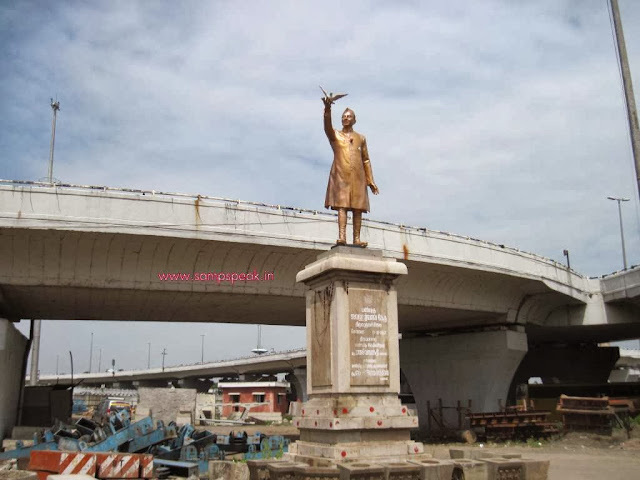 some Chennaites would remember this ~ at the all important junction known as Kathipara [now overshadowed by the clover bridge and Alandur Metro Station] was once a junction, a roundabout with the statue of India's first prime minister Jawaharlal Nehru. The statue was removed from its place to give way for the flyover and now stands forlorn in the roundabout from airport towards Porur beneath the bridge. It has some added significance as on that fateful day in May 1991 –on an election campaign, Rajiv Gandhji landed up at Madras, met the press, stopped at Kathipara Junction at around 0915 pm to garland Jawaharlal Nehru’s statue …… reached Sriperumpudur, garlanded the statue of Indira Gandhi and took that fateful step at around 10.20 pm at Sriperumpudur… makes a sad reading. A few years ago, during the elections in Uttar Pradesh Election Commission (EC) ordered masking of the umpteen elephant statues that Mayavati had erected across the state. In Tamil Nadu in 2014, they issued orders to cover CM’s pictures on the boards of "Amma Unvagam" (Amma Canteens), her block-buster food security initiative that serves hot cooked meals to thousands of people every day. A fortnight ago, in a move defying every logic came the order to cover beautiful kolams inside Sri Villiputhur Sri Andal Temple under the pretext that they were lotus, party symbol of BJP’. There were many protests on the social media and subsequently that order was revised. Now read this news in TOI Chennai edition : activists who garland freedom fighter Su Nellaiyappar’s statue in Chromepet on his birth and death anniversaries every year had to keep their routine celebrations on hold till the last moment. Poll officials had covered the statue mistaking Nellaiyappar for a political leader.Members of a local organization submitted a letter at the Chromepet police station and sought help to remove the cloth wrapped around the statue. S Meenakshi Sundaram, treasurer of Tamil Peravai, spoke to the assistant returning officer and election officer after which the statue was uncovered. “We have been garlanding the statue for 30 years. We also distribute food to 100 poor people in the neighbourhood on his birth and death anniversaries. We have been trying to approach officials to let us garland the statue but they kept dodging us,” said Meenakshi. With the celebrations in doubt till Thursday morning, Tamil Peravai members could not arrange for the food.“Nellaiyappar was not a politician and there was no need to cover his statue,” said R Ramadoss, lawyer and social activist. Nellaiyappar was a native of Parali, a village in Tirunelveli. A school in his name was later set up in the mid-1950s in Bharathipuram, Chromepet to educate children free of cost. He had donated the plot for the school. However, it was shut down due to lack of patronage.